Northampton self-proclaimed pop-punks Potty Mouth formed at Smith College in 2011. Their self-titled EP came out in August. The EP, produced by John Goodmanson in Seattle (Sleater-Kinney, Bikini Kill) delivers five tightly-packed, driving songs that are severely catchy. Questions concerning the construction of self, how Weems sees herself, and how others perceive her permeate the EP, along with visions of different lives she could live. My favorite lyric on the record is about friendship: “Some of the people who know me best live so far away it’s crazy that we ever met.” Musically, the record feels both current (“The Bomb” features the angular riff-rock that put Speedy Ortiz on the map) and also reminiscent of the music that defined riot grrrl-era Olympia. In addition to making music, many musicians — especially of a DIY bent — also make their own visual art. This is true of Potty Mouth. 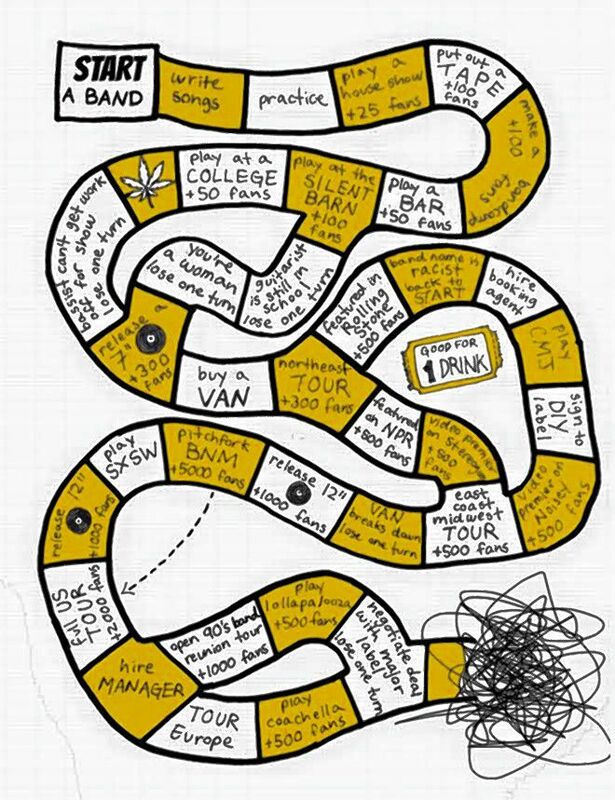 Lead vocalist and guitarist Abby Weems recently drew a board game called “Start a Band.” Appropriating the style of a children’s game, Weems’ drawing tows viewers through a sassy, self-aware, and cutting retrospective of the slog — or, in her words, “game” — of starting a band. Deploying the device of a board game affords a playful tone that allows Weems the ability to drop dry and blunt commentary on both the music industry and the dynamics of band life: “Being a woman, lose one turn,” “guitarist still in school, lose one turn.” The game ends with “negotiate deal with major label, lose one turn.” The spaces then become a distressed, scribbled mess with an ambiguous conclusion. The game is perhaps more telling than the EP of where Weems sees herself in her career. Potty Mouth has changed — they’ve grown, signed with a major label, and are facing new obstacles as both individuals and as a band. How they negotiate staying true to their DIY roots and the elevation that comes with their well-deserved success will be a challenge. The EP, despite being represented by a scribbled mess on a satirical board game, represents a strong achievement. I wish the band the best of luck through the trenches of the music game without losing any turns. Basemental reports twice monthly on the local DIY music scene. Contact Will Meyer at wsm10@hampshire.edu.